Shambray: Nordstrom Gift Card Giveaway! You guys! Who doesn't love shopping? Ok. So there are some that do not, but most women love it. What makes it even better is when you get to go shopping with a gift card that you won! Fall is in the air so I am excited to be a part of this giveaway because Nordstrom has so many great Fall fashion finds! See details below. I am so excited to be teaming up with 17 other beautiful bloggers to celebrate labor day weekend, giveaway style! 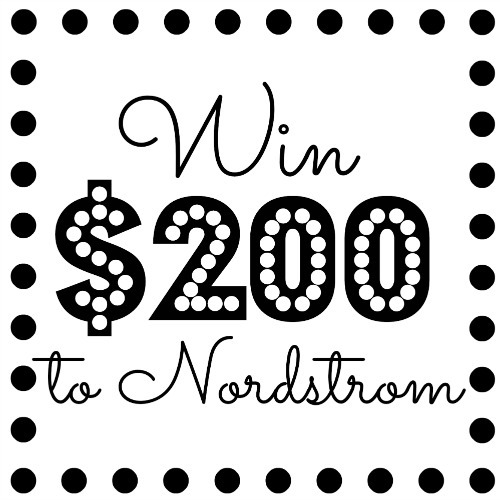 One of you lovely readers will be winning a $200 Nordstrom gift card just in time to stock your closet with some amazing fall clothes and accessories! So, go ahead, enter to your hearts desire. And remember, if you complete every entry, you will get 10 extra entry points and the more points you get the more likely you are to win! To enter use the rafflecopter below. This giveaway runs until Tuesday, September 9th at midnight! Good luck and don't forget to stop by the lovely co-hosts blogs and show them some love! Winner is not picked by me. Winner is picked by Megan from All That Glitters. I would spend the gift card money on my wife. The End. I really hope YOU win! You deserve it! It would be so awesome to go shopping without worrying about the money.